It has been 8 years since we published our first overview comparing two display technology. Back then, it was plasma and LCD but today plasma is no longer and a new competitor has arisen in OLED. In this overview we will look at the differences between the two technologies, pros and cons, and more. We will start out with a short introduction of how each display technology works. We will be using the term “panel” because the display technology is one – although very important – component of a functional TV screen. Besides the panel, there are support structures such as a cabinet and a frame as well as lots of electronic circuits. LCD panels have not changed fundamentally over the last 10 years. LCD is short for “Liquid Crystal Display” and describes the active element of the display that is made from liquid crystals. In an LCD display the light source is located behind the panel and emits light from a rack of LEDs (Light Emitting Diodes), whereas earlier, manufacturers would use more bulky fluorescent lamps (CCFL). The LEDs can either be placed either along the edges of the LCD panel (Edge or edge-lit LED) or behind the LCD panel (direct or backlit LED). With edge-lit LED it is difficult to control the light intensity locally across the screen, as the LEDs emit light from the edges only. This light has to be reflected to cover the entire screen area with the help of a light guide. Therefore light intensity can only be controlled in bands. With backlit LED the diodes are placed behind the panel, which allows for better local control as the LEDs can be arranged in a grid and potentially be addressed individually or in zones. The highest number of diodes in an LCD display to date is 5200, which is only possible on a large 100” panel. Each diode will therefore illuminate approximately 6400 pixels (Ultra HD resolution). Light is typically reflected through several plastic layers that serve the purpose of making light distribution homogeneous. These light diffuser layers will sit between the LEDs and the LCD panel, meaning that the complete backlight unit takes up a considerable amount of space, making the TV thicker. To control light intensity for each of the basic colors, LCDs use liquid crystals inside each pixel. These crystals can be rotated in the cell by manipulating an electrical field, making it possible to adjust the light throughput. Once the light intensity of a basic color has been adjusted to its desired level, it passes through a color filter that filters out all wavelengths except red, green or blue. If you move close to the screen you can see these red, green and blue sub pixels that in pairs of three make up one pixel. How fast an LCD panel can change color depends on how fast the liquid crystals can move into a new position. 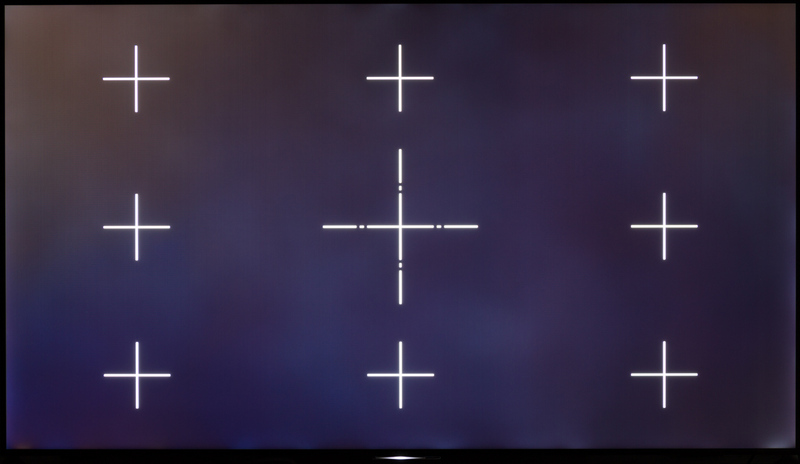 This determines the amount of blur/trailing you see in the picture. Ideally, you want the liquid crystals to assume the new position (color) instantaneously. However, that is not possible and it usually takes the liquid crystals a little time (measured in milliseconds) to do so, meaning that blurring/trailing can occur. When light passes through the liquid crystals light intensity can no longer be sustained in all directions. If you think about an incandescent bulb it can emit equal amounts of light in all directions (it is called a Lambertian emitter) but in an LCD display the use of liquid crystals means that the panel will emit most of the light directly forward. 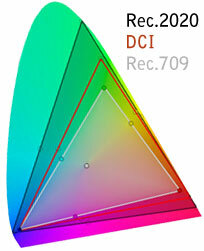 Or in other words; light and color intensity will look strongest, and purest, only right in front of the screen. This phenomenon is important in order to understand the concept of “viewing angles”. 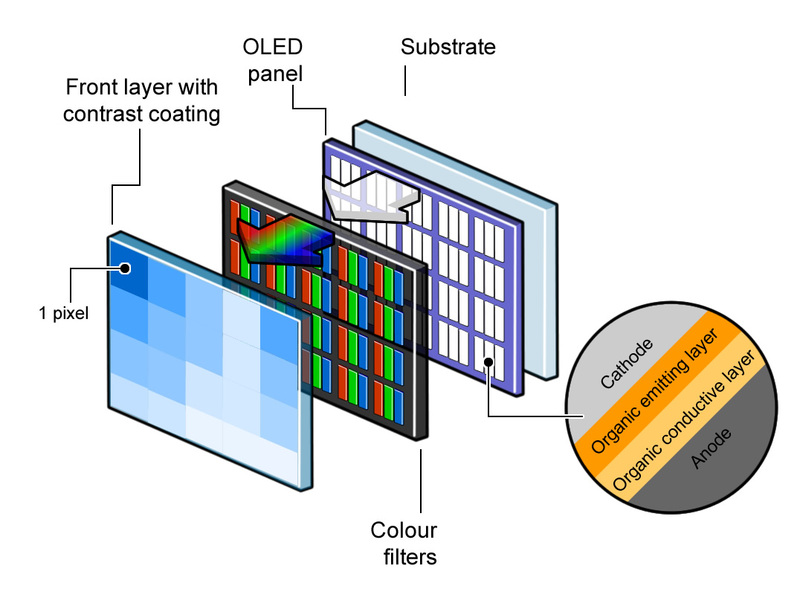 As you may know, OLED is a special kind of LED, namely an organic type (“O” for organic). We have previously explained how light is created in a LED (article only available in Danish, sorry) but since then we have witnessed the emergence of displays in TV-size formats, and the different types of OLED panel technologies that we discussed to lengths in 2009 have been reduced to only one. The OLED panel is in structure different to that of LCD since light intensity is no longer controlled with a LC (liquid crystal) layer. Instead, each single sub pixel is its own LED (or to be precise: OLED). In this structure several layers of the sandwich can be eliminated as each sub pixel emits white light. This light – that is emitted separately for each individual sub pixel – then passes through a passive color filter, like with LCD, and out through the display. The method to regulate light intensity and the mix of red, green blue (RGB) involves controlling the intensity of the given OLED that is placed behind the red, green, and blue sub pixels, respectively. If you want a pure black color you simply turn off all sub pixels and if you want white you increase intensity to equal amounts in all of them. The way that these OLED panels are produced allow manufacturers to make them considerably thinner than the LCD’s LED light source, which is why OLEDs are thinner than LCDs. If you peel off the LED backlight unit an LCD panel is also very thin but it requires a backlight to reproduce a picture. It is important to emphasize that LG Display is currently the only commercial manufacturer capable of mass-producing OLED TV panels, which is why LG is controlling the development of OLED TV technology at the moment. In the tables below we summarize the characteristics of the two technologies. We have seen LCD panels with edge LED that are almost as thin as OLED panels. However, since an LCD TV requires a light guide to distribute light evenly across the panel there is a limit to how thin the LCD display can become. Without the support structure an OLED display can become so thin that it can literally be rolled up like paper. However, we have yet to see such models make it to the consumer market. One of the major culprits when it comes to thickness of a TV today is the electronic circuits used to drive the panel as well as all the power supply and the interface input and output ports. Without this “lump” both LCD and OLED would be considerably thinner than today but there are very few TVs in existence that have moved all these components to a separate box. Difference between the worst and best LCD is very significant. Low bottom-level. Difference between the worst and best OLED is small. High bottom-level. There is currently only 1 OLED panel type for TVs, produced by LG, since Samsung has given up on OLED TVs. That is why most OLED TVs share common traits. The differences typically compose of variations in resolution, HDR, 3D and so on. LG’s OLED panels are used in TVs from Panasonic, Loewe, Philips, Metz, Bang & Olufsen, Vestel, Grundig, Skyworth and others. The different types of LCD means that these are significant differences in picture quality. See the LCD section for addition information. There is actually no such thing as “viewing angles” on an OLED TV. The light source is a lambertian emitter, which means that equal amounts of light are emitted in each direction. The latest generation of HDR LCD panels is capable of outputting a considerable amount of light – well over 1000 nits in peak brightness. The liquid crystals’ ability to block light, however, remains unchanged, meaning that when light intensity increases, black level worsens significantly. Or in other words: the dynamic range gets pushed upwards so that black gets washed out. An OLED TV is limited by the amount of power that the full panel can draw at any given time, meaning that it can reach high level of peak brightness in a few pixels but as more pixels reach full illumination to the peak brightness level, overall brightness of the panel drops. Peak brightness is typically 600-700 nits (2016 figures). It is important to emphasize that when one pixel goes to full peak brightness the adjacent neighbor pixel can still be completely black. This is possible because OLED can control the full dynamic range in each individual pixel at the same time. This is sometimes referred to as pixel-level control. The figures are based on 2016 specifications. The black level in an LCD panel is determined by the liquid crystals’ ability to block light, which is never perfect. LCD panels with liquid crystals of the VA type are better than IPS panels in this regard as IPS has visibly less intense blacks. By turning down the backlight source the panel can compensate for the liquid crystals’ inability to completely block light. However, no LCD can control the full dynamic range on a pixel-level basis. See the LCD section. The black level in an OLED display is essentially defined by how dark the panel can look when it is turned off. Turning off the OLED pixel creates black so deep that eye cannot perceive any light leakage, which is one of the unique abilities of OLED technology. It is not without reason that OLED is promoted as “OLED is the new black” because it is in this are that the technology really excels. Because LCD has to block a constant backlight source behind every pixel it cannot reach very high contrast levels. Some light will leak through. That is why LCD panels often take advantage of dynamic or local dimming to control backlight intensity depending on the picture content. By reducing backlight intensity it is possible to reproduce deeper blacks - and similarly for white. However, this leads to “blooming” around bright objects on dark canvases and “black holes” that crush shadow details since the LED grid cannot be controlled individually for every pixel. A typical LCD has 0-20 zones whereas high-end LCDs typically have 100-500 zones. There are over 8.2 million pixels (Ultra HD) and close to 25 million sub pixels in an LCD panel. OLED has an infinite contrast ratio because black is reproduced at 0.0 nits. There are no “blooming” or “black holes” issues as OLED has pixel-level light control. An OLED display has the ability to reproduce a full black pixel and full white pixel adjacent to each other. No light spills over. This is one of the fundamental differences between OLED and LCD technology. On OLED the contrast ratio is absolute and always extremely high. On LCD the contrast ratio is relative. The dynamic range on a given LCD depends on the panel type and backlight implementation. The worst LCD TVs (that claim HDR support) can reproduce only 8 f-stops. The best LCD TVs with full array local dimming (FALD) can reach 15-17 f-stops, but not without introducing visible haloes around glowing object in contrast-rich scenes. The 15-17 f-stops number is a best-case scenario that the LCD can only reach for certain picture scenes. The best LCDs can reach higher peak brightness levels than OLED but are held back by the inability to reproduce true blacks. The more zones in an LCD, the higher the dynamic range. As can be seen in the “peak brightness” section OLED cannot reach the same peak brightness levels as LCD but it can reach visibly deeper blacks. The ratio between these two (white and black) is called the contrast ratio and ‘dynamic range’ can help describe what lies between the two extremes. OLED can reproduce over 20 f-stops and can do so without introducing bleeding/clouding/blooming/halos. The dynamic range of any OLED TV in any price class is higher than the dynamic range of the best LCD TV. ’Dynamic range’ has many similarities to contrast but can be a better way to think about picture dynamics when discussing HDR. The dynamic range is not measured lineally but logarithmically. Every f-stop (or dynamic stop) is a doubling in light intensity. - The difference between 16 to 512 nits is 496 nits in absolute terms, but 5 f-stops. - The difference between 512 to 1024 nits is 512 nits in absolute terms, but only 1 f-stop. The goal for year 2020 is the reach the much wider Rec.2020 color space that covers 75% of the colors that the human eye can perceive. 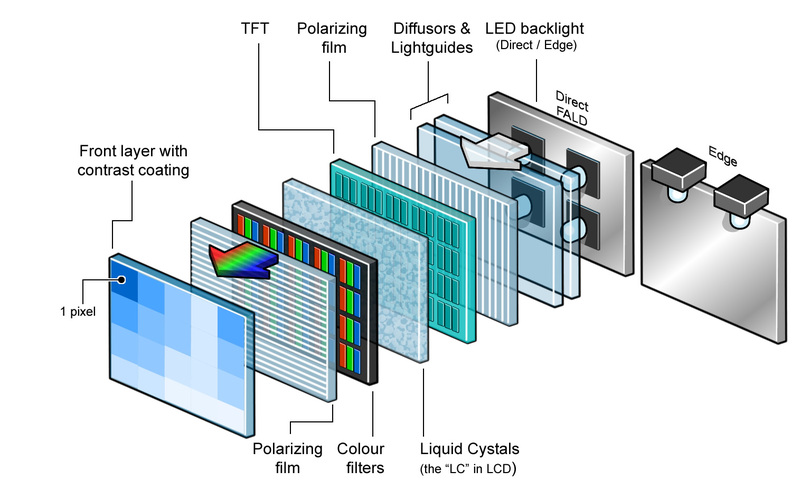 LCD has the potential to reach Rec.2020 by utilizing quantum dot filters but the best LCDs currently reach 96-97% of the smaller DCI-P3 color space. The goal for year 2020 is the reach the much wider Rec.2020 color space that covers 75% of the colors that the human eye can perceive. It is not yet clear how OLED will technically reach that goal but the addition of quantum dots in the elemental structure has been proposed. The best OLED TVs today reach 96-97% of the smaller DCI-P3 color space. HDR for video comprises several elements. LCD can reproduce the highest peak brightness but cannot reproduce the darkest tones faithfully without halos. This is due to the fact that LCD cannot control the full brightness range from black to white on a pixel level. The most high-end LCDs typically have 200-500 local dimming zones. Major difference between the worst HDR LCD TV to the best HDR LCD TV. HDR for video comprises several elements. OLED can reproduce true black but cannot reach the same peak brightness as LCD. However, OLED can control the full brightness range from black to white on a pixel level, which means that a full black and full white pixel can be reproduced side-by-side. This is essential for HDR reproduction. Minor difference between the worst HDR OLED TV to the best HDR OLED TV. 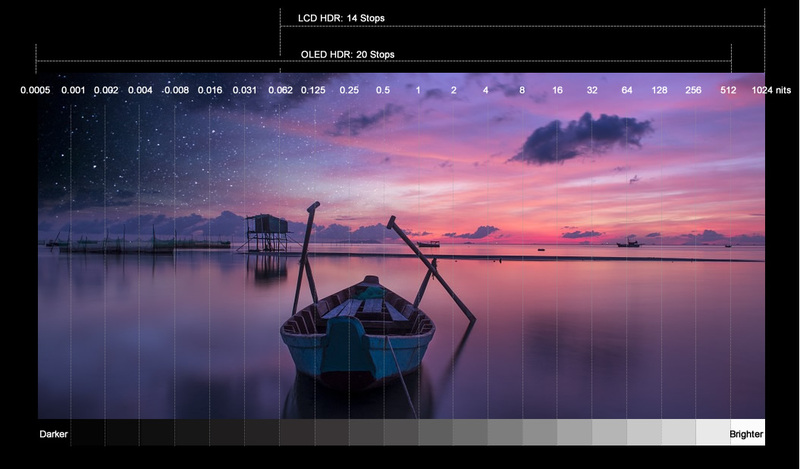 HDR typically goes hand in hand with UHD resolution but can also be added as a layer on top of HD. The industry has defined minimum requirements for HDR in the ”UHD Premium” certification program. LED light has to be distributed evenly across the LCD panel, which is not easy to do. 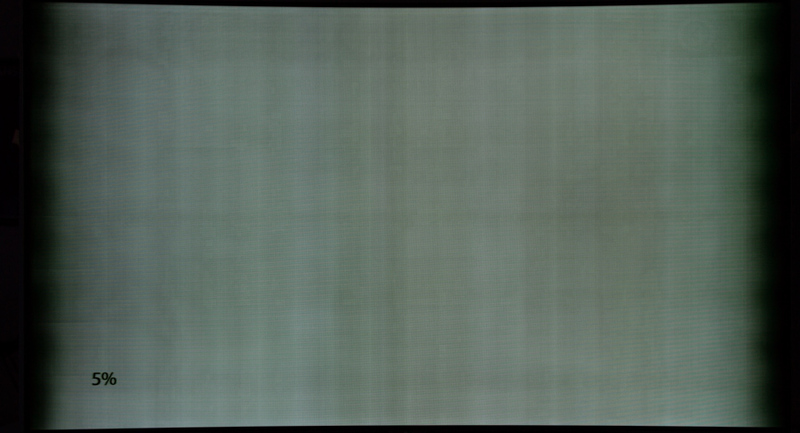 Most LCDs with edge LED suffer from significant light homogeneity issues, which manifests as “bleeding” (from the edges) and “clouding” (light clouds on the panel). Backlit LED is better but can suffer from vertical light bands. Full-array local dimming (FALD) LCD is even better but on the other hand suffers from “halos” around bright objects (for example stars on a black sky). Inhomogeneous backlight is one of the LCD technology’s fundamental problems. It has been an issue since the first LCD TVs and got worse with the shift from CCFL to LED backlights. OLED has no backlight but homogeneity issues can still occur if the light level varies somewhat across the pixels in the panel. Early generations of OLED TVs suffered from vertical bands that appeared slightly brighter. There are also reports of “vignetting”, which can look like dirty clouds or uneven light distribution on dark grey colors. The issues appear to have been reduced to almost insignificant levels on the 2016 models, leading many to classify them as first/second-generation problems that will be eliminated as OLED matures. An LCD display consists of layers that light can be absorbed or reflected in, making pictures look washed-out. It is hard to find a matte LCD panel today, as all of them seem to have adopted a glossy coating. This coating can help maintain the picture’s contrast but also reflects light from your surroundings, like a dark mirror, which can affect black levels somewhat. The least reflective LCD panels have a reflectance level of 2%. An OLED display consists of one layer, which ensures that the picture does not look washed out in a brightly lit environment. However, reflections can still occur but they will not affect the absolute black level in a significant way. 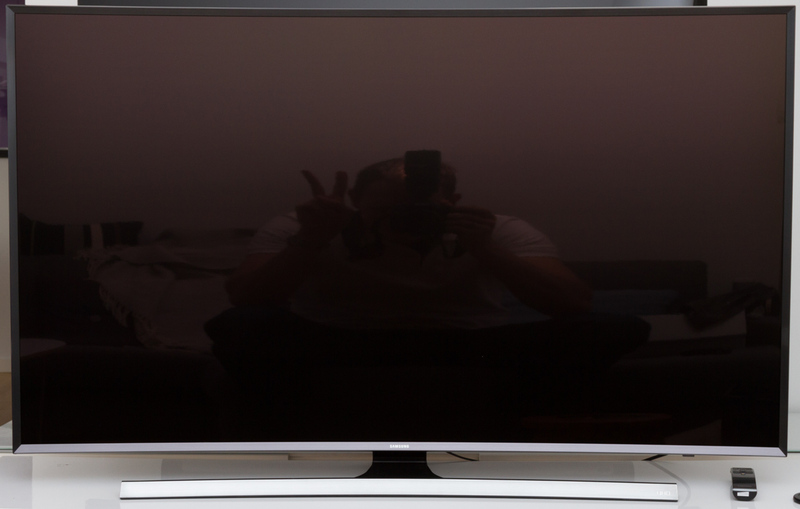 The latest generation of OLED TVs has a reflectance level of around 1%. On paper a difference between 2% on the best LCDs and 1% on the best OLEDs may not sound significant but it can is visible. Curved TVs can help reduce reflections but only if you are seated in the sweet spot. From other viewing positions curved screen can magnify reflections from bright objects in the room. Below you see a curved and flat LCD. Inside each pixel are liquid crystals. These crystals can “turn” by applying various levels of electrical voltage. If they turn too slowly, blur will occur. LCD has, per definition, motion blur but the issue has been reduced significantly over the years. The amount of blur depends on the color shift. The shift from for example black to white can happen very fast (the highest electrical voltage applied) whereas the shift from purple to red (lower electrical voltage) happens more slowly. On LCDs you can also experience “motion halos” around moving object, sometimes called ‘overdrive trailing’. All modern LCDs use an overdrive circuit to help boost (overshoot the target color by a little) most color shifts in the liquid crystals. LCD panels can use “scanning backlight” to reduce motion blur – see comments below. OLED technology has, per definition, no motion blur and is often specified with a 10 μs (0.01 ms) response time. However, OLED panels today are driven like LCD panels with a sample-and-hold principle (unlike plasma, which drew a new picture constantly, or in other words flickered). The use of sample-and-hold can introduce a small amount of motion blur but it is not something that people usually notice on OLED because OLED can shift between all colors equally fast, unlike LCD. The risk of motion blur on OLED exists but it is very low. OLED TVs are not currently utilizing techniques such as backlight blinking or black frame insertion, which could potentially improve motion reproduction (but also introduce flicker) – see the comment box below. Motion blur is typically caused by two factors. It can happen because the display panel’s pixels have too slow response times and because of how the human eye perceives the world. The eye has “memory” when it comes to perceiving light; also called retention. This means that bright objects stay on the retina unless something changes in the visual environment. Introducing a black frame from time to time, which the TV industry has taken advantage of with “scanning backlight” systems, can help accomplish this. In order words, the black frame constantly “resets” the human eye, bringing down perceived motion blur. Input lag can vary significantly from one model to another. It also depends on what picture mode you use. It is not uncommon that input lag can reach 75-150 ms in one of the pre-defined picture modes with dynamic settings. Many TVs offer a special “Game” mode with much lower input lag that can be activated for the game console’s HDMI port. The best LCD TVs reach <20 ms input lag, which is considered low. Input lag can vary significantly from one model to another. It also depends on what picture mode you use. It is not uncommon that input lag can reach 75-150 ms in one of the pre-defined picture modes with dynamic settings. Many TVs offer a special “Game” mode with much lower input lag that can be activated for the game console’s HDMI port. The best OLED TVs reach <35 ms input lag, which is higher than the best LCD TVs. However, it primarily relates to the picture circuit and is not determined by the actual display technology. The risk of burn-on on LCD is very low but it can happen if you abuse the LCD panel. For example by leaving it turned on for several days in a row. However, there is no reason to be concerned about burn-in on LCDs. Burn-in is permanent whereas retention is temporary. 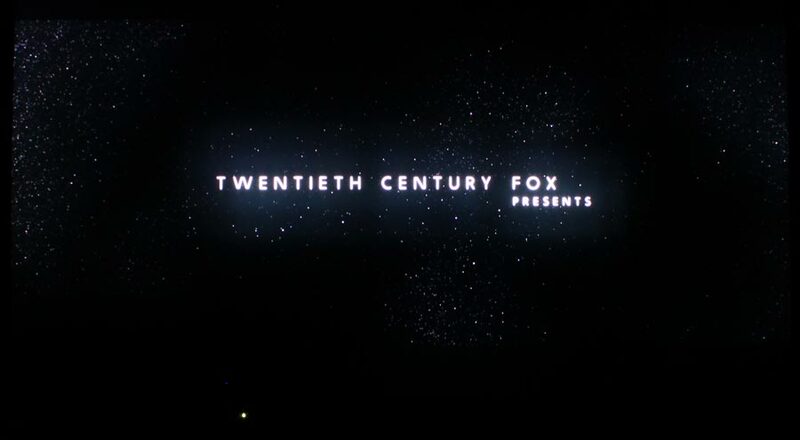 The photo below reveal a burned-in channel logo on a 2016 OLED TV. The risk of dead pixels was far higher in the beginning of the LCD lifetime cycle. Today, we rarely see dead pixels on LCD panels and with Ultra HD resolution it is close to impossible to spot a dead pixel from a normal seating distance. Dead pixels can occur on OLED, too, but it is rare and with Ultra HD resolution it is close to impossible to spot a dead pixel from a normal seating distance. There have been a low number of reports where pixels get stuck and emit a constant light. For a dead pixel to occur, the small controller unit behind each pixel has to get stuck. This can happen on all types of displays. The difference is how it looks in practice, which is typically determined by the passive state of the pixel. Dead pixels can occur in the sub-pixels (the three pixels that make up 1 pixel) and a pixel. An LCD panel requires a backlight. This makes up some of the total weight. Edge LED weighs less than backlit LED. On top of that you can add electronic circuits, speakers etc. The choice of materials also plays a role..
An OLED panel weights very little but it cannot carry its own weight so it needs some type of rigid structure to support it, for example glass or metal. On top of that you can add electronic circuits, speakers etc. The choice of materials also plays a role. There have been exhibited OLED TV prototypes that weight less than 2 kg. All ports and electronics were moved to a separate connector box. If you remove all electronic circuits a TV would weigh significantly less. LCD would, however, still be slightly heavier than OLED. You can typically transport an LCD TV horizontal or standing. However, the larger the LCD display, the more careful you have to be with transporting it horizontal. Because there are more than one layer inside the display it is prone to cracking under pressure. OLED can potentially be very sturdy since it can be created on a plastic substrate. However, a consumer OLED TV is so thin you have to be careful. OLED TVs are no stronger than the frame support allows. Transport OLED standing. An LCD panel’s power consumption is less dependent on the type of picture content than OLED because the LED backlight is the main source of power consumption. Most LED backlights are relatively stable but do consume more during the day than night (to accommodate the higher brightness level). LCDs with local dimming typically fluctuate more but also consume higher overall power; typically 30-90W more. 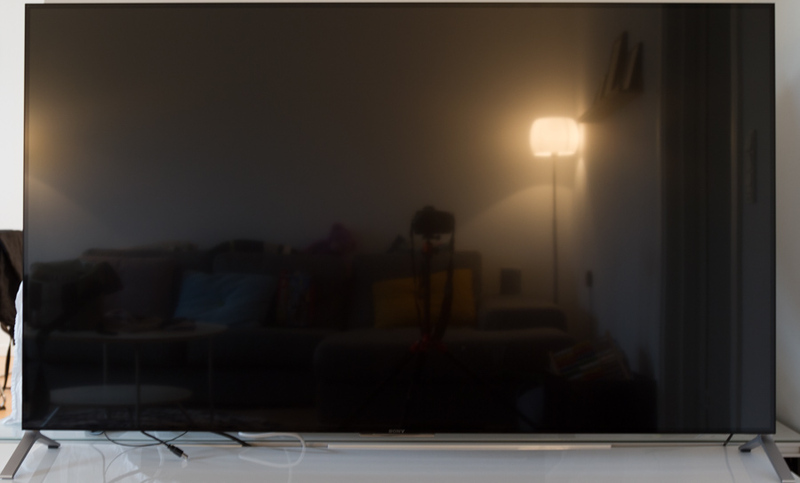 HDR typically increases power consumption by 40-90W because LCD max out the backlight unit in HDR mode. An OLED panel’s power consumption depends heavily on the type of picture content. A very bright movie scene consumes more power than a dark scene. This happens because each individual pixel consumes power when emitting light – there is no backlight unit. HDR typically increases power consumption 20-50W. See our TV review power consumption measurements here. LCD TVs have existed for over a decade so the industry has a good grasp of its limits. The backlight unit in an LCD TV is typically rated for 60-100.000 hours of operation. Often, other components in the TV – such as the electrolytes – die before the LCD panel. The first OLED TVs were sold in 2012 and are still running. LG claims “100.000 hours for 2016 OLED”. The colors in OLED with RGB pixels can age differently but LG is utilizing white OLED pixels that can lose brightness intensity over time. LG says that algorithms in the TVs continually compensate for any decay. If a manufacturer has used “too cheap” components the type of panel technology is irrelevant. The TV will die. The constant pressure to deliver “more for less” can sometimes affect the quality of the components in TVs, which can affect lifetime. In most cases, a component will die before the display panel fails. The LCD panel is silent and the same is true for the LED backlight unit. However, LEDs generate heat, especially in full-array local dimming LCD TVs, and that may require fans. These fans can be noisy. The OLED panel is silent and each pixel generates only a modest amount of heat so there is no need for fans. A cheap power supply can, however, buzz at times because the OLED panel’s power consumption fluctuates depending on the type of picture content. Only few cases of buzzing power supplies have been reported. Noise from components such as a power supply is typically caused by the manufacturer’s cost-saving efforts. Issues such as noise can also vary from one sample to another and depend on your environment (warm or cold). A power supply is more prone to be noisy on OLED and full-array local dimming LCDs because the power consumption level fluctuates constantly. However, most noise-related issues today are caused by noisy fans, it seems. OLED TVs exist in 55” and up. The supply chain is not very extensive or well developed so production costs are expected to drop significantly as production is ramped up. The goal of this article is not to declare a winner or loser among two competing display technology but rather to outline advantages and disadvantages inherent to each technology. We leave it to you to decide which attributes matter the most. At the moment OLED TVs are still significantly more expensive than LCD TVs, but are expected to become more affordable over the next few years.